It seems like a long time coming. Nearly two years have passed since AppleInsider exclusively reported in September of 2007 that Apple's next big product initiative would be a modern day reincarnation of its beloved-but-defunct Newton MessagePad. And it's believed the device had been slowly evolving as an R&D project for at least a year prior. 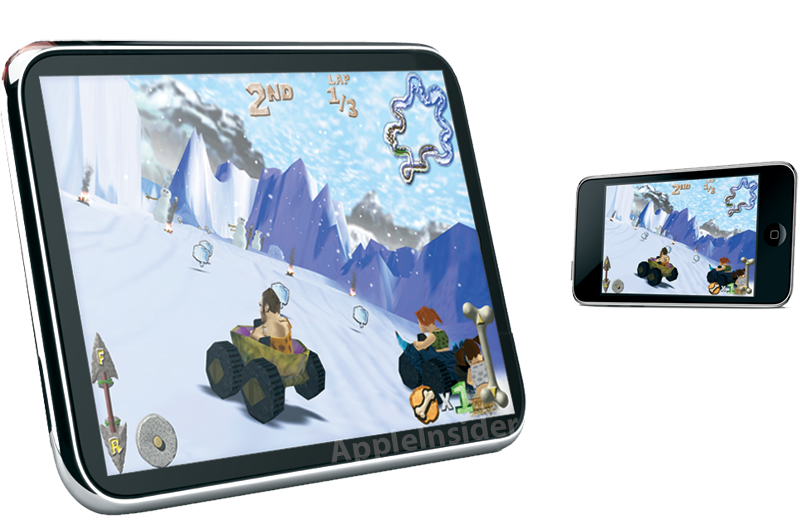 The 10-inch, 3G-enabled tablet, akin to a jumbo iPod touch, is the latest brainchild of chief executive Steve Jobs. That distinction, as insiders will tell you, carries its share of baggage. Under the critical eye of Jobs, contours must be precise, each pixel of the interface has to match a particular vision, and there can be no fault —no matter how slight —or it's back to the drawing board. As such, AppleInsider has observed silently as the project was reset at least a half-dozen times over the past 24 months. Each time, development was frozen and key aspects of the device rethought, retooled and repositioned. At times, those close to the Apple co-founder had their doubts that it would ever see the light of day, just like a smaller PDA device he canned a few years after returning to the company. However, the past six months have reportedly seen the critical pieces fall into place. Jobs, who's been overseeing the project from his home, office and hospital beds, has finally achieved that much-sought aura of satisfaction. He's since cemented the device in the company's 2010 roadmap, where it's being positioned for a first quarter launch, according to people well-respected by AppleInsider for their striking accuracy in Apple's internal affairs. That means that the device, which is expected to retail for somewhere between the cost of a high-end iPhone and Apple's most affordable Mac notebook, is bound to turn up any time between January and March, should there be no last minute setbacks. Analyst's following the Cupertino-based company may consider factoring first full-quarter sales of the device into their models for calendar Q2. Although Apple maintains publicly that it's thrilled with the relationship it has with exclusive U.S. wireless provider AT&T, the company has a bone or two to pick with the carrier behind closed doors. It's no secret AT&T's lagging has delayed some vital aspects of the iPhone experience stateside, and as such, other people familiar with the matter say Apple is now in active talks with rival Verizon Wireless over the possibility of the carrier playing a key role in providing Internet access for its tablet device. AppleInsider has also picked up in recent months that its initial artist's rendition of the tablet device was off the mark proportionately and has since taken another stab at what the product may look like in respect to the iPhone, as can be seen below. Much of the holdup in bringing the multi-touch tablet to market is thought to have revolved around a particular issue for which Apple struggled to find a solution, before ultimately settling on a brain transplant. Upon conception, it's believed the device was destined to be based around Intel's first Atom processor, then dubbed Silverthorn. Deborah Conrad, a vice president in charge of Intel's Apple division, went on record in March of 2006 as saying that her colleagues were excited that Apple was "thinking different" about her company's upcoming offerings and the possibility for future Apple gadgets using the chipmaker's technology. Though she ruled out the possibility of an Intel-based iPod, it was the prospect of other devices that reportedly got her team "very, very excited." Indeed, rumors would follow that Apple had signed on to adopt Atom in some of its products. These products never materialized. Though AppleInsider admittedly lacks hard evidence to this end, hints from insiders suggest that the company was dissatisfied with the battery life it was achieving from pre-production devices employing such chips. It was around this time that the company moved forward with its $278 million buyout of fabless chip designer P.A. Semi. Dissatisfied with existing system-on-a-chip solutions incapable of producing the results it sought, Apple's objective was to create its own around ARM-based designs renowned for their superior power management characteristics. This decision is believed to have led to considerable discontent on the part of Intel executives who —looking to jump-start their Atom platform —were less than thrilled over the loss of Apple's business. Sentiment over the matter appeared to come to a head a few months later when a pair of Intel executives had a field day badmouthing the iPhone and its embedded ARM processor at the company's developer forum in Taipei. That was the same forum where the chip maker was touting its upcoming Moorestown platform for next-generation mobile Internet devices (MIDs) that encompasses a future-generation Atom chip. Intel vice president of mobility Shane Wall teamed with colleague Pankaj Kedia, the chipmaker's ultra-mobility ecosystems director, in lambasting the iPhone as a device dependent on technology that was, so they claimed, a full two to three years behind that which Intel could offer. "If you want to run full Internet, you're going to have to run an Intel-based architecture," Wall told a gathering of engineers, further asserting that the iPhone "struggles" when tasked with running "any sort of application that requires any horse power." "The shortcomings of the iPhone are not because of Apple," added Kedia. "The shortcomings of the iPhone have come from ARM." Wall then jumped back in and alleged that "even if they do have full capability, the performance will be so poor." To that, Kedia added: "I know what their roadmap is, I know where they're going and I'm not worried." It was a nasty one-way exchange that prompted Intel's senior vice president Anand Chandrasekher to issue a correction less than 48 hours later over the "inappropriate" comments made by his lower-level executives. In the correction, Chandrasekher distanced Intel from the executives' remarks and conceded that Atom had a long ways to go before it could attempt to rival the power efficiency and battery life characteristics that ARM chips provide for handheld devices.